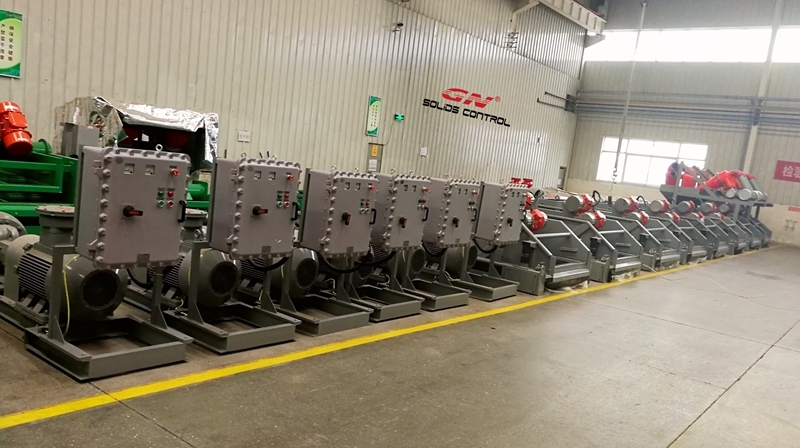 This week GN shipped decanter centrifuge ,shale shaker, mud cleaner, centrifugal pumps and control panel to Russia clients, with their customized color silver grey. Control panel is GN new products since we already have our own GN solids control brand explosion proof certificate and IEX EX certificate. We produce the starter of shale shaker, mud cleaner, control panel of centrifugal pumps, mud agitators, decanter centrifuge, mud tank system and other electric control system by our own workshop, also we make positive pressurized VFD control panel for decanter centrifuge and vertical cuttings dryer by ourselves, this is for faster delivery time, better quality control and to reduce the production cost, this will help us to improve the complete quality of our equipments, and make our price competitive. Centrifugal pumps are also produced in our No. 2 workshop in Dachang Chaobai River Development area, 2 km far from the headquarter of GN solids control, and 30km by drive from Beijing International Airport, welcome to visit GN facility in Beijing for watching our workshop and production machines. Pump casing material is hard ductile iron which increases abrasion resistance capability. Wide open-vane impeller creates lower axial thrust to improve bearing life, non-adjustment mechanical seal to provide zero leakage and longer operation life, and all the bearings used from top brand for reliable operation. 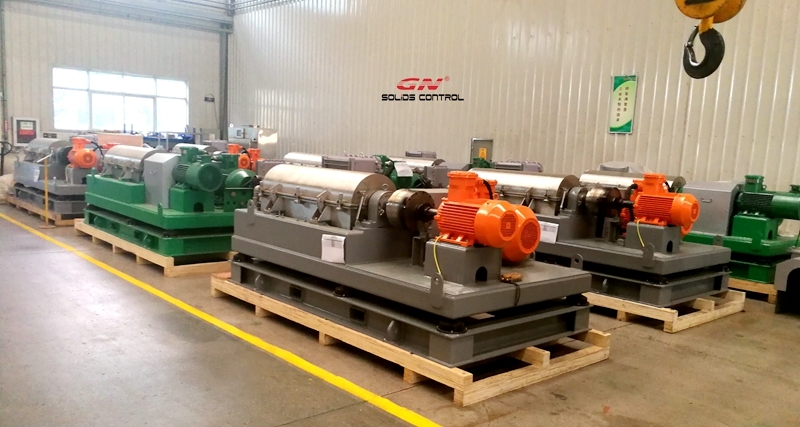 This week GN solids control shipped one set of 1000gpm mud recycling system for trenchless project in India, this is for our old client who ever bought our 500gpm HDD mud recycling system several years ago and he is satisfied with the performance and working life of our mud system, so this year for their new HDD machine, they decided to use GN brand mud recycling system again. 2) GNZS703F-2S desander with 2 ea of 10 inch desander cone, the separation cut point is 75 microns. 3) GNZS703F-12N desilter with 12 ea of 4 inch desilter cone, the separation cut point is 25 microns, this is a three phase cleaning mud recycling system, especially for big trenchless project, the 3 phase cleaning system can clean and recycle the drilling fluids better than 2 phase cleaning system, even though the 2 phase cleaning system with cheaper price, compact design, but the 3 phase cleaning system is with higher price, better performance. 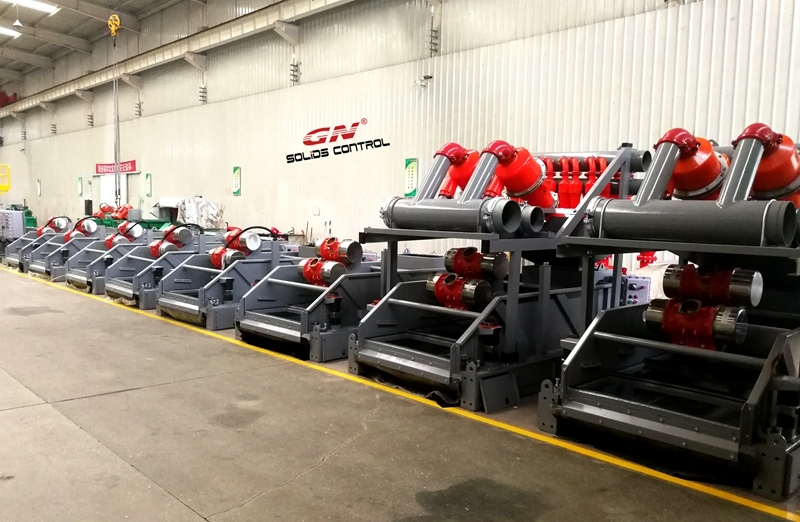 GN solids control always provide customized design mud cleaning system for our clients. Sometimes we will combine the bottom shale shaker, desander cone, desilter cone 3 in 1 as mud cleaner, this is to save place on the mud tank, and save money for the client, but the separare desander with bottom shaker and separate desilter with bottom shaker will separate the solids better. 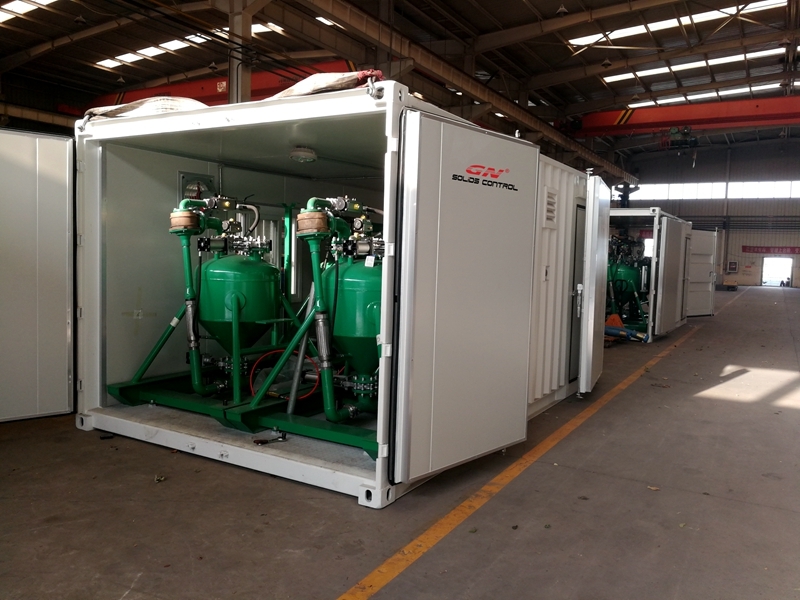 4) 3 units of 40 ft container size mud tank, 1 as mud cleaning tank, 1 as mud storage tank, 1 as mud mixing tank, complete with centrifugal pump, mixing hopper, mud agitator, mud gun, mud tank handrails, walkways, clean gate, man hole, valves, etc. 3) 3 units of 4 panel shale shaker, each shaker installed with 4 pcs of composite material frame shaker screens as per client’s required API NO. 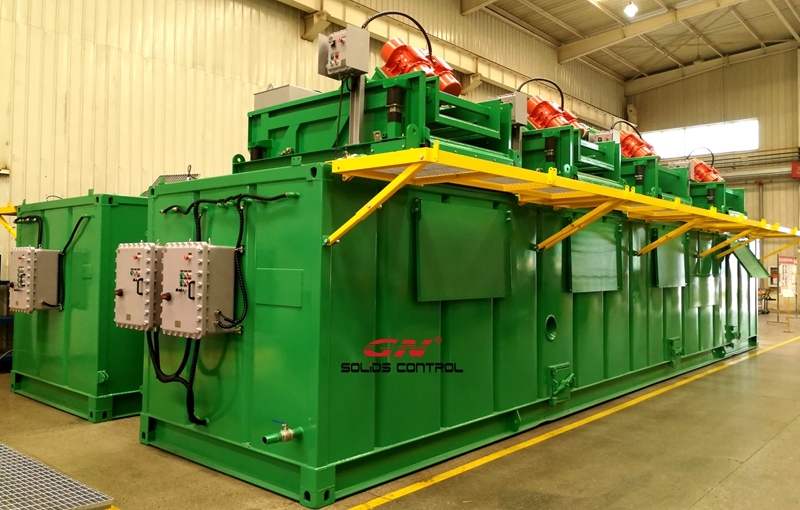 If you require the triple shale shaker or tandem shale shaker, twin shale shaker, pls contact with GN solids control for more information. 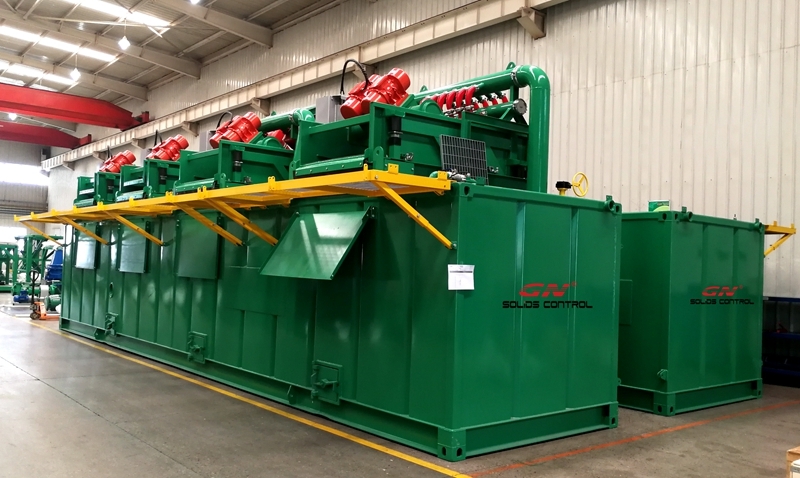 The purpose to make the triple shale shaker unit is for convenient shipment, easy installation and save place in the mud tank. 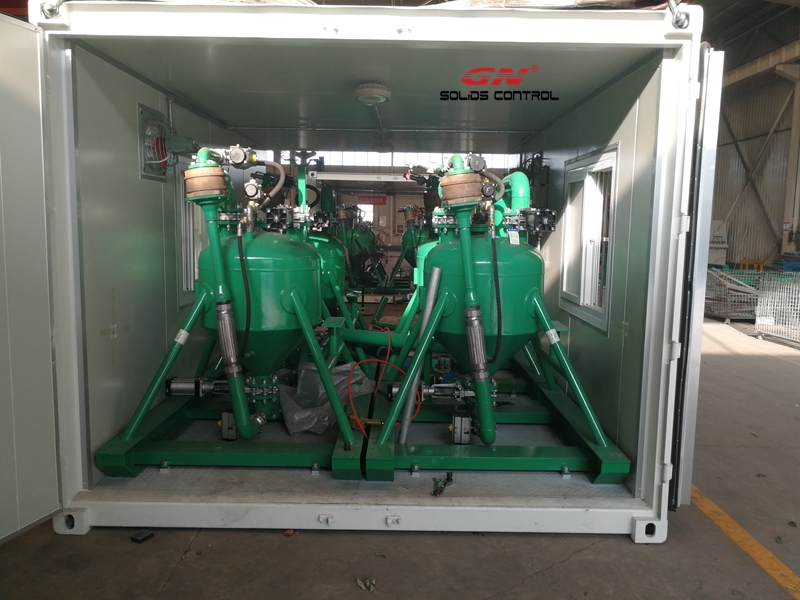 We installed DGMS / UL/ ATEX/ CE / IEC EX/ CNEX approval vibration motors 2 units on each shale shaker, and the starter is explosion proof with rain proof/ sun proof cover. GN also provide middle speed centrifuge for barite recovery, high speed centrifuge for low gravity solids separation, VFD decanter centrifuge for drilling fluids recycling. 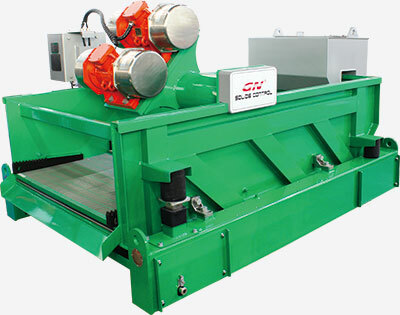 Centrifugal type degasser or vacuum degasser to separate the gas from the gas-cut drilling mud. We also provide complete solids control system based on the client’s special requirement, with all the solids control equipments installed, including mud agitator, mud gun, centrifugal pump, water pump, diesel pump, slurry pump, mud gas separator.